West Windsor, N.J. - On Sept. 29, MCCC faculty joined with students from the Mercer Honors Program, the Phi Theta Kappa International Honor Society, and NJSTARS, collectively known as the Honors Consortium, for lunch at the Conference Center. The welcome event was designed "to help build a sense of community among Mercer scholars," says Dr. Carol Bork, associate professor of English, who coordinates the Honors Program with Sociology Professor Gianna Durso-Finley. 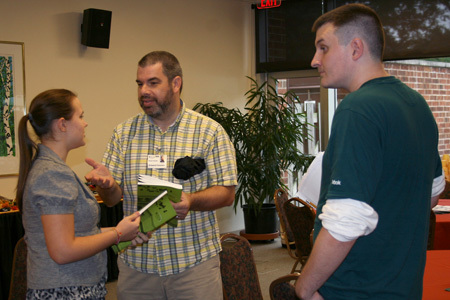 A second reception was held later in the day for students who take evening classes. During the event, faculty members described the many academic opportunities and resources at the college. Addressing students, Associate Professor of English Diane Rizzo spoke for instructors in the Honors Program when she said, "It is a privilege for us to be working with you. We look forward to getting to know you better, advising you and helping you reach your educational goals." Observed Liberal Arts student James Reslier-Wells, who is currently taking an Honors course in Fantasy Literature with Professor Ed Carmien, "It was great to get together in one place and start making connections with other students. It was also great to learn about the opportunities here at Mercer. There was a lot of energy in the room." According to Dr. Bork, in past years each of these groups had their own reception, but with much overlap and much in common among this population of motivated students, it just made sense to bring them all together early in the semester. 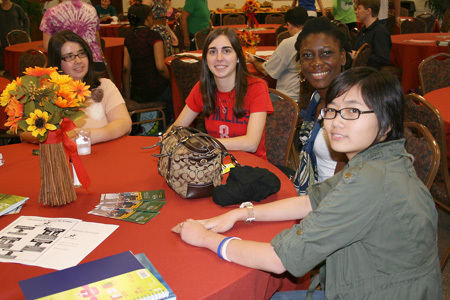 Approximately 250 students participate in one or more of these programs at Mercer. Professor Durso-Finley notes that the Honors Consortium at Mercer has two goals for students. "We are about scholarship opportunities and about opportunities for scholarship," she said. Honors Consortium students head for lunch at the Conference Center. English Professor Ed Carmien distributes the 2011 Kelsey Review. Students had a chance to meet in a social setting, as well as learn more about opportunities for honors level learning at Mercer.